I am going to attempt to share a bit of this wonderful quilt show with my readers. Hopefully many of you were able to get there yourselves. It was such a big and busy event, so capturing it in photographs is mission impossible. I am, however grateful to my husband and daughter for their patience and perseverance for getting some photographs to share with you. Though the quilts are no less than magnificent pieces of art and deserving of the best light possible to adequately showcase them, quilt shows are typically located in exposition halls or gymnasiums and both the lighting and our photos don’t do justice to many of their beautiful colors. Perhaps, like me, however, you will enjoy looking at a few quilts in the comfort of your home when time can be taken to appreciate their rich detail, even if the pictures may be less beautiful than the quilts themselves? Selecting from the many beautiful and fun quilts is hard, but I have decided that this will not be the only time that I feature them in my blog. The ones I have chosen today demonstrate some of the most richly detailed quilting I have ever seen. Gilding the Arbor by Bethanne Nemesh of Allentown, Pa. is done using “whole cloth quilting, oriental silk tapestry and old botanical etchings”. Her design is original and the rich and closely quilted background makes her designs actually puff up almost like they were trapunto quilted. She wrote that her “flora and fauna were free drawn on the quilt with chalk and refined with wash out marker using her own photography, gardening catalogues and copyright free floral designs”. This was done on a longarm quilting machine. Another that displayed beautiful longarm quilting was Pennsylvania Hearts and Hands by Kelly Cunningham, Stevensville, Pa. She wrote that “this quilt is a reproduction made by Elsie Bott Loucks and others in her family. The pattern used is from the McCall’s Quilting Vintage Series Hearts and Hands”. She has added rich long arm machine quilting to her borders, around her appliquéd designs and then added unique and different quilting designs in the spaces.between her appliquéd designs. These pictures are of Sunflower Sutra by Helena Scheffer and Marion Perrault of Beaconsfield, Quebec, Canada. They wrote, that it “was inspired by a real sunflower. The petals and leaves contain hundreds of pieces collaged onto a flannel foundation, while the center features fused ovals. The whole flower is applied to an artist dyed background” It is quilted on a home machine by Helena Scheffer. Dimension and flow are so beautifully quilted into this piece to add to its rich design. These are pictures of Indian Summer by Alexandra Nickerson of Colchester, Vermont. She wrote that her “sunflower petals were made from fabric hand dyed in a Phil Beaver workshop and machine appliquéd on a commercial batik background. The quilt was bonded to a backing to create a firm piece. Placement, design and quilting are original”. It was quilted on a home machine. Again this piece is wonderfully quilted adding depth and beautiful detail. Duffer was done by Patty Williams, Plessis, NY. She writes, “this is a portrait of my daughter’s Goldendoodle started from an 8" x10” photo”. She wrote that she “took a workshop called My Best Friend by Butler Miller. She made a pattern from our photo; after enlarging this pattern, Duffer was created with fusible appliqué and lots of thread painting”. It was quilted on a home machine. I could go on and on, but will feature only a few quilts today. There are many more photos to share with you. I loved all the varieties of quilts: the miniatures, the artistic wall hangings, the traditional, the whimsical, the historical, those with bold designs, those that make a statement, the scrappy ones and crazy quilts with rich, gaudy needlework detail! Every year I see new techniques I have never seen before! I am amazed at the many artists that create in their own homes all over the world! Besides the quilt show, the vendors are equally as spectacular! I was adamant before going that I wouldn't purchase a thing as I thought I had it all in my little studio. My declaration was false as was my resolve! Every year I find that what I own is but a smidgeon of what is available, and I will never tire of acquiring another piece of material, learning new techniques or getting another notion to add fun and creativity to my stitching! 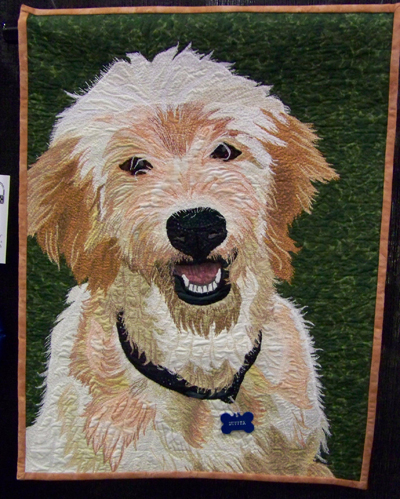 The Vermont Quilt Festival is held every June in Essex, Vermont. It is the largest quilt show in New England and for those that have never been, or live far away, please be advised that there is affordable housing at a nearby college for all who want to travel and stay to take in the entire show and classes. Bus service between the show and the college facilities is provided as well. It is definitely an event worthy of planning a trip to see, and not far away is the infamous Shelburne Museum. Check both out on line and plan a trip of a life time! The Shelburne Museum also houses many beautiful quilts along with their spectacular collection of early American buildings, art, and wares, not to be missed! WOW! These are amazing! I hope Maria enjoys these too! It is really worth the trip! We look forward to it every year and I have nearly my whole family going with me! I LOVE that sunflower quilt. Absolutely Gorgeous!